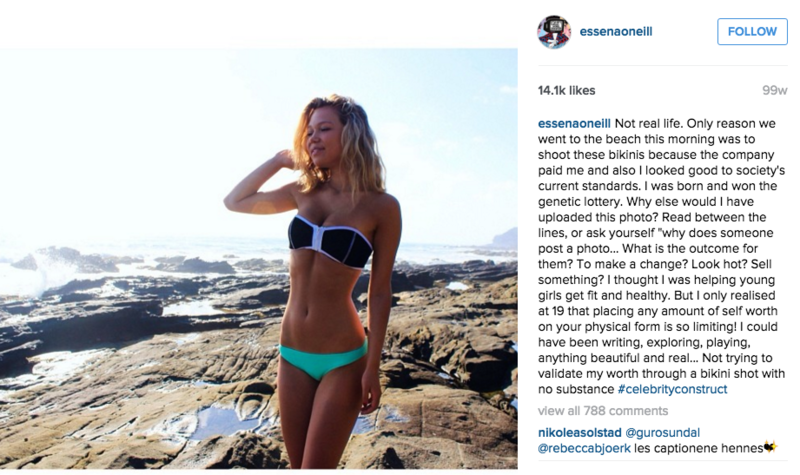 If you have been on the internet the past few days, you have probably heard of Essena ONeill. Essena is a 19 year old Australian with over 770,000 followers on her social media channels including Instagram, Youtube and Snapchat. Earlier this week Essena posted a Youtube (which had over 1 million views before she closed her account). This video highlighted the negative impacts social media has had on her personal life as she pleaded that “social media is not real life”. Essena came out and admitted to her fans that although she appeared to be living the "perfect life" she was deeply unhappy. She has since launched her own website promoting ethical advertisement and living in the moment. This is a marketer's blog response to Essena ONeill. Essena took to Youtube and Instagram to call out how much brands paid her to promote products. After deleting almost 2,000 pictures from her Instagram she went back and edited the captions to explain what really went on behind the photo, including how much brands paid her to promote their products. See examples of her new Instagram captions below. Although her posts highlight some of her emotional and personal reasons for shedding light on this topic, her message should serve as a huge wake up call for influencers, brands and consumers. Love her or hate her, she has opened the floodgates for everyone to take a step back and asses the impacts that paid promotional posts on social media are having. Influencers need to realize that in order to retain and engage their audience they can't promote every brand that comes knocking on their door. In the long run an influencer will lose their audience if they fail to provide them with relevant and unique content. Influencers who begin pushing tons of promotional content risk loosing the following they worked so hard to gain. 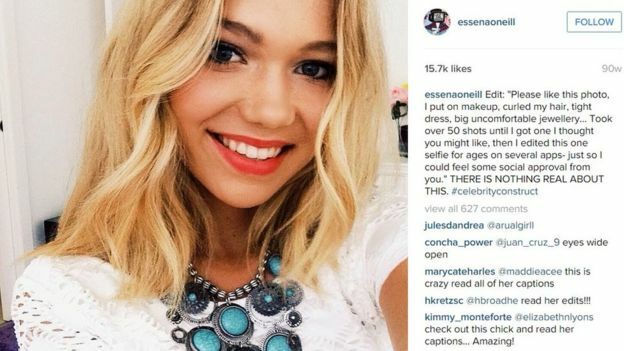 Consumers were never in the dark that brands were paying their favorite influencers to promote product, but Essena's recent stunts have brought heightened consumers attention to this. When consumer's realize that they are being sold to, the trust between the consumer and influencer is broken and trust is the reason influencer marketing works in the first place. Brands need to realize paying an influencer simply because of the number of followers they have does not resonate with consumers and certainly does not drive ROI or have measurable impact. Brands can easily avoid being the "bad guys" by working with influencers who are passionate about a brand's message. As someone who works in the influencer marketing space, I have to admit, Essena’s incident initially alarmed me. The idea that an influencer would have this large of a public meltdown caused my mind to immediately race to the impacts this would have on the space as a whole. But as I thought about it more, Essena’s actions have shed light on many of the problems with the current state of influencer marketing. Recently in the space there has been a significant increase in the number of opt-in services which promote buying influencers for set prices. Many companies sell a marketplace of influencers where brands simply pay to gain contact information or have the influencer post about their brand. This transactional system of influencer marketing is not sustainable and is the biggest mistake in influencer marketing. This is not to say that influencers should not be paid for their time and effort. By all means - brands should pay their influencers, but transactional influencer marketing has no real value. When executed improperly, influencer marketing gets a bad reputation. As consumers, we all hate bad influencer marketing. Bad influencer marketing is easy to spot because posts are paid, one-time, irrelevant and/or off-brand. Consumers pick up on this because it is not true influencer marketing, most the time it is merely product placement. There are vast differences between the paid and earned influencer marketing. Paid influencer marketing is simply promotional and yields no long term results, where earned influencer marketing is focused on building long-term relationships with relevant influencers. The problem with this sort of influencer marketplace is that it encourages and validates transactional influencer marketing. Transactional influencer marketing does not work because you are not building relationships with influencers or seeing if your brand and the influencer have aligned goals and values. Would an influencer promote this brand if they weren't being paid? Brands and influencers alike should be asking themselves this key question. Would an influencer promote your brand if they weren't being paid? If the answer is no, as a brand you should steer clear of working with this influencer. When payment is the only motive for an influencer to work with a brand then the brand and influencer are most likely not well aligned or working towards the same goals. If the answer is yes, there is an opportunity to build a relationship with that influencer. If answering yes to this question is a no brainer, it should serve as a clear indicator that this would be a good influencer to work with. Essena is not alone in speaking out about off-brand product endorsements. More and more influencers are using their microphone to raise awareness around the issue. Even Lady Gaga made a statement explaining that "I don't like being used to make people money" and on a larger scale, "we are unconsciously communicating lies". Influencers themselves don't feel right promoting brands that they don't believe in. My hope is that Essena's incident serves as a wake up call and inspires marketers to establish a new rule of thumb. Influencers and brands alike need to hold themselves to a higher standard when deciding who to work with. This is the first wave of change that will have a domino effect and establish better influencer marketing best practices. 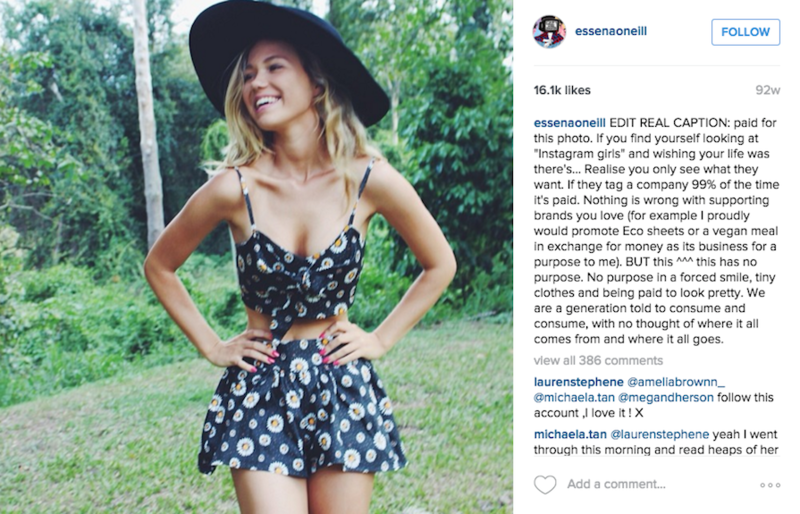 What impact do you think Essena's post will have on the influencer marketing industry?